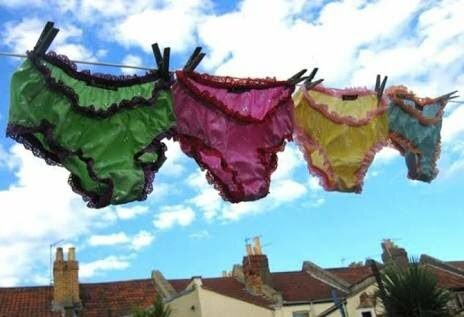 Many ladies have been more safety-conscious since the upsurge in the level of underwear theft in the country, the News Agency of Nigeria (NAN) reports. NAN interviewed a cross-section of Lagosians on Monday to find out probable reasons for this menace and safety measures ladies are taking in order not to fall victims. Respondents said perpetrators of the evil act, believed to be internet fraudsters or better known as “Yahoo Boys”, would stop at nothing to get wealthy overnight. Ngozi Orina, a Clinical official told NAN that women should be more careful and mindful of those they hang out with. “I am a married woman and have no intention of having extra-marital affairs. “But even at that, I am careful with my personal items. “I don’t put my underwear in the public space,” she said. Orina, a mother of two, said women, especially young ladies, must not be carried away by flashy things because those things only led to destruction. “This is the time to be very conscious and spiritually-inclined about those things we see around. “It is a wicked world we live in. “We also have to educate our children and care-givers so they don’t fall into the hands of the agents of destruction,” she said. Similarly, Igwe George, a postgraduate student of the University of Lagos, cautioned women not to get carried away with the flashy lifestyle of yahoo boys. “The menace of internet fraud is barbaric and an act of laziness. “It is also greed on the part of the ladies because only a lady who is not contented would be swayed away by mere cash. “Something needs to be done fast to address this issue,’’ George said. He said that sadly, that some ladies often sold their underwear, even with a knowledge of what it would be used for. “I’ve heard of situations where ladies sold their underwear because of the love of money. “Parents need to train their children to be morally upright,” George said. He advised ladies to make sure they hang out with and date only guys who had the legal and upright means of making money. Another respondent, Anita Mbonu, told NAN that she did not believe theft of underwear was real until a distant friend of hers died from the same incident. “When I heard about what was happening in the country, I didn’t believe it at first. “A distant friend, who was dating a yahoo boy, needed urgent spiritual attention because she was bleeding from her private part. “She died after some days and I was very devastated,’’ Mbonu narrated. She said the incident made her to be more aware of the friends she kept and places to go to. “If today, I found out that my boyfriend is a fraudster, I will leave him for good,’’ Mbonu said. She also told NAN some of the things to look out for when trying to identify an internet fraudster. According to her, yahoo boys always have laptops around them; like to be reserved to themselves and curious about happenings in their environment. Corroborating the views of Mbonu, another respondent, Osage Jethro, said internet fraudsters dressed irresponsibly and had tattoos all over their bodies. “They wear expensive clothes but they go about with smaller cell phones. “When you look through their contact list, you will find foreign numbers and contact with code-names like loader, dealer, among others,” he said. Jethro said that it was only the Yahoo boys that one would see spending extravagantly without traceable means of income. He advised youths in the act to stop because the consequences were not far-fetched. Jethro said laziness, peer pressure and lack of education were some reasons why boys ventured into the act. “Most yahoo boys are not educated but want to live like celebrities.